Resurface your skin with Dr Dennis Gross Alpha Beta Pore Perfecting Cleansing Gel, a gentle yet powerful makeup remover that leaves the complexion glowing. Infused with Alpha Beta acids to sweep away dead cells and reveal the newer, smoother skin underneath, the exfoliating cleanser also utilises Willow Bark to delve deep into pores and unclog spot-causing bacteria and impurities. The weightless gel replenishes vital hydration to skin to maintain a healthy moisture balance, leaving the complexion looking radiant, refreshed and refined. Free from soap, parabens and sulphates. Vegan and cruelty-free. Water/Aqua/Eau, Glycerin, Sodium Lauroyl Methyl Isethionate, Propanediol, Sodium Cocoamphoacetate, Cocamidopropyl Hydroxysultaine, Disteareth-75 IPDI, Glycereth-7 Caprylate/Caprate, Sodium Chloride, Trisodium Ethylenediamine Disuccinate, PEG-40 Hydrogenated Castor Oil, Mandelic Acid, Glycolic Acid, Salix Alba (Willow) Bark Extract, Phytic Acid, Potassium Azeloyl Diglycinate, Citric Acid, Farnesol, Barosma Betulina Leaf Extract, Sodium PCA, Sodium Hyaluronate, Tremella Fuciformis (Mushroom) Extract, Aloe Barbadensis Leaf Juice, Bisabolol, Hydrolyzed Soy Protein, Camellia Sinensis Leaf Extract, Butylene Glycol, Caprylic/Capric Triglyceride, Dimethyl Isosorbide, Alcohol, Sodium Phytate, Jasminum Officinale (Jasmine) Flower/Leaf Extract, Vitis Vinifera (Grape) Fruit Extract, Lavandula Angustifolia (Lavender) Flower/Leaf/Stem Extract, Eugenia Caryophyllus (Clove) Flower Extract, Polyglyceryl-3 Laurate, PEG-7 Glyceryl Cocoate, Sodium Hydroxide, Benzoic Acid, Sodium Benzoate, Potassium Sorbate, Phenoxyethanol. 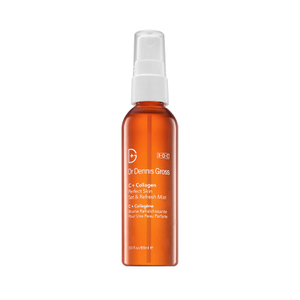 Receive a FREE Dr. Dennis Gross Skincare C+Collagen Perfect Skin Set & Refresh Mist when you spend £125 on Dr. Dennis Gross Skincare.